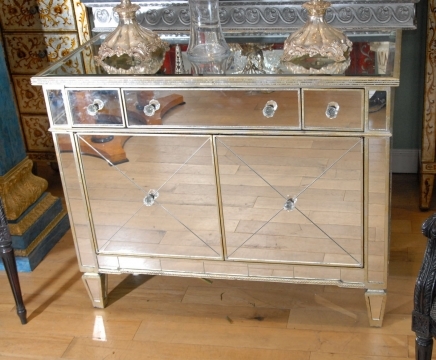 650You are viewing a gorgeous Italian mirrored chest or commode in the art deco style. I hope the photos go some way in conveying the quality to this piece, it’s certainly better in the flesh. Mirrored furniture is all the rage at the moment if you read interior magazines like World of Interiors, and it’s not difficult to work out why. They have a funky look, as well as adding light and space to any interior. This piece has ample storage with the two drawers that slide out smoothly and the two cupboards beneath that open out. The glass is clear and blemish free and the piece is very solid and sturdy. In between the mirrored sections are the silver gilt edgings in antique finish. The gently tapered legs further accenuate the clean, minimal aesthetic to the design. This is offered in perfect condition ready for home use right away and we will ship to anywhere in the world. 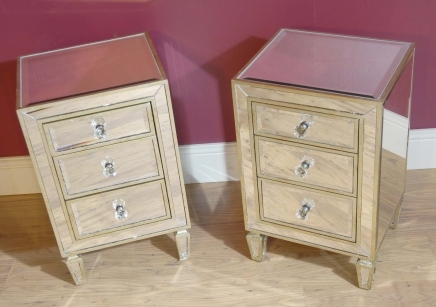 You are viewing a gorgeous pair of Italian art deco style mirrored bedside cabinets or chests of drawers. 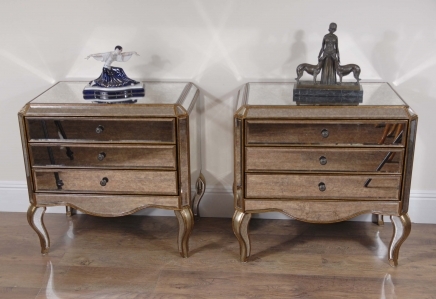 With three drawers on each this versatile pair offers ample storage space. Mirrored furniture has that perfect look of funky decadence – as well as practical properties as the mirrored surfaces add space and light to any interior. The cabinets sit on cabriole legs and are offered in great shape, solid and stable ready for home use right away. The glass has an antique finish and is scratch free and in great shape. We will ship to anywhere in the world so get your bids in early. You are viewing a gorgeous pair of mirrored art deco style cabinets. These really are the epitome of 1920s style and elegance and would look the part in various interiors schemes. Each cabinet comes with three drawers so there is ample storage space. The design is very clean and simple as is typical of the art deco aesthetic. Both cabinets are offered in perfect condition ready for home use right away. We bought these from a dealer we regularly visit at Alfies Market on London’s Church Street.